Hi, At present time billion of users must have to use latest technology Android Smartphone. There are lot of tips and trick you have to apply on your smartphone. In this article today we have to discuss about the important trick how to keep Safe and secure Android device with Android Device Manager App. This is Google Android Device Manager App, it is very useful app in terms of lost or misplaced your Android Device. This app provides facility to locate or find your lost or misplaced Android device from the web and you can also lock & erase your device when your device gets stolen. 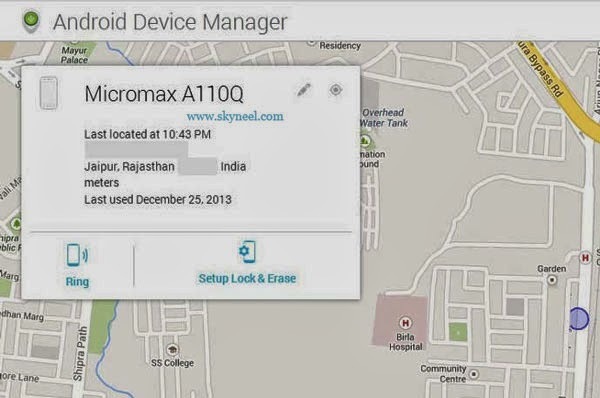 Android Device Manager App provides by Google and it is free app for all of Android users. This app helps you to keep secure your personal and important data. This app offers you to reset your device’s screen lock PIN and erase all your data remotely. This is a small size app, it is only 1.8 MB. You can install this fabulous app on Gingerbread 2.3 and an upper version of Android. So safe and secure Android device with this app. You can locate your Android devices via your related Gmail account. And this app allow to you, reset your Smartphone or other device’s lock PIN of screen remotely. You can remotely erase your entire data on the Smartphone or other device’s by this app. You can install this fabulous app on (Android Device Manager app) from the Google Play Store click here. I hope you like this Android Manager App from which you will be able to easily Safe and secure Android device without any extra efforts. If feel any problem in this guide then please use comment box. Kindly, follow all these given steps carefully and share your knowledge with your friends, colleague, family members and others. Thanks to all.